I’m delighted to offer my latest selection of ambient electroncia. 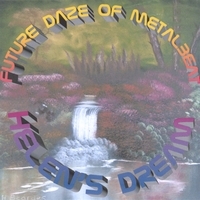 The 2006 CD (Helen's Dream). This hour long concept piece has been created with relaxation in mind. This musical journey is based around the theme of dreams takes you on a calming trip through rainforests, African villages, oceanic beaches, playgrounds and more, via choirs, sparkling synthesizers, songbirds, oceans and soothing piano. Sit back and unwind through this fascinating and rewarding journey of dreams. This CD is dedicated with love to my wonderful partner – Helen. I have been following with interest the development of the music of Ian Price the musician behind Future Daze Of Metalbeat & School Of Ambience. piece that keeps you interested in it. As well as this Ian has produced numerous other ambient tracks with highlights being "White Horses", "After The Rain" and "Lost In The Moment - Part 2". I'm sure you will not be disappointed. "Gary Hunter (Skin Deep / The Definition Of Sound)"
This may be a one track disk but has enough to keep the listener interested. An ambient journey which takes your mind off to many different places. An ingenius piece of work!